Available in the iTunes App Store! Simple, easy-to-use, smart, and reliable. We believe this is the must-have app for all expectant parents and their coaches at the end of their pregnancies. 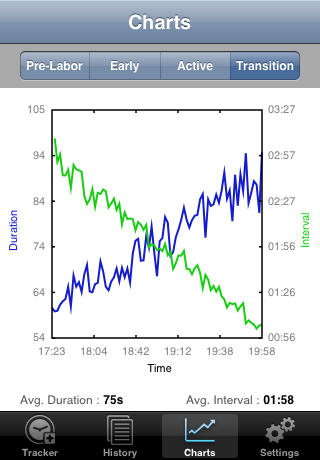 Contraction Tracker provides expectant mothers and their coaches a way to time and track their contractions during labor. Contractions are timed, recorded and saved, categorized into the different phases, and plotted on a chart so that you can see at a glance whether or not you may be progressing. *An alert is also issued to let you know when to take action such as when it is time to head to the hospital. User tested during labor at the hospital, the Contraction Tracker is the app that will reliably track and time your labor contractions so that you and your partner can focus on getting through your labor pains. After a great deal of research, careful thought, and testing, we are excited to be finally releasing the Contraction Tracker. We hope all expecting parents and their coaches will find our tracker as useful as we did during our pregnancy. Congratulations and best of luck! We would love to improve on our tracker so we strongly encourage any feedback you may have. You may also want to check out the FAQs for more information. * Note: The alert feature is no longer being offered in the US store due to patent infringement. The Contraction Tracker is not intended to be a substitute for professional advice and should not be used for any medical diagnosis. Through research, we have tried to make the tracker as accurate as possible. The duration and interval values are good measures in indicating how you are progressing in labor but another important factor is actual cervix dilation. Only your medical caregiver will be able to relay this information through a physical examination. 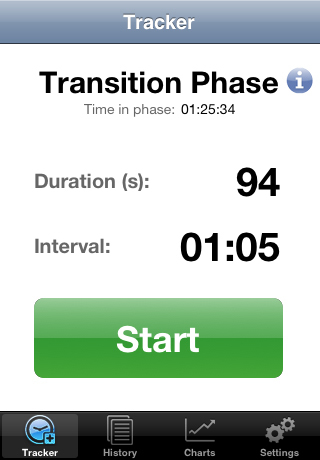 Like many of the other similar iPhone apps, we were also inspired to create a contraction timer application when we were expecting. We came up with the idea after our prenatal class at the hospital. As it was explained to us, the procedure for timing contractions and knowing when to go to the hospital seemed a bit confusing. At the time, we did not even know that there were timers already out there to help you. After brainstorming about our ideal app, we started to conduct some research. 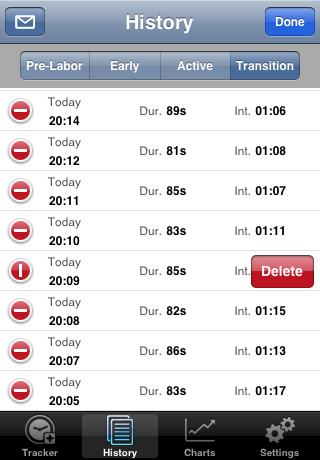 As it turned out, there were actually two other apps that timed contractions, but nothing like how we wanted it to. Timing contractions is a fairly basic application but the problem is that many of the iPhone Developers are not UI Designers and they tend to design their own ideal app, without giving much regard to the actual users. The user will likely be the expecting father, but could also be the expecting mother herself or anyone else in the birthing suite at the time of labor. Essentially, the app needs to work for the doula, sister, parent, grandparent, doctor etc. Labor and birth is one of the most stressful times of a person’s life so a user-centered design for a contraction tracker is crucial.